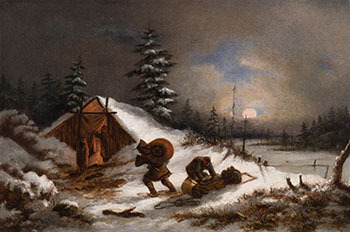 Cornelius Krieghoff often depicted the lives of First Nations people and early settlers amid the challenging conditions of winter. In a number of works he showed lean-to winter camps, some sheltering sportsmen with their guides and some with First Nations people, such as we see here. 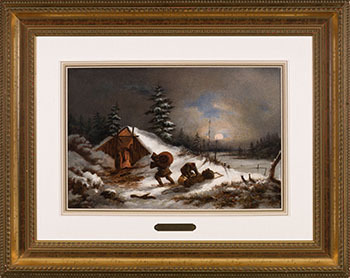 This rare moonlit scene showcases Krieghoff’s fine painterly abilities, a product of his European training. A bright full moon lights up the clouds and reflects across the snowy riverbank and trees. Krieghoff’s fine attention to detail adds much to the scene – from the inclusion of snowshoes and a toboggan to the woman and child waiting to greet the men, who bring vital supplies. In the night sky, the bluish colouration is a phenomenon seen when the moon is very bright. Krieghoff’s vision of early life in Canada was primarily a romantic one, and in Camp at Moonlight we are struck by the beauty of the moonlit scene and the warmth of the family reunion. The Montreal Museum of Fine Arts has a similar 1855 Krieghoff oil entitled Indian Hunter and His Family in its collection.